So there I was, sat in the crowds at the opening keynote for CES 2009. Steve Ballmer was on stage, selling Microsoft like only he can, when he stopped to run a video. The spotlights went down, the screens at the side of the stage lit up, and a procession of Windows devices flashed onto them. 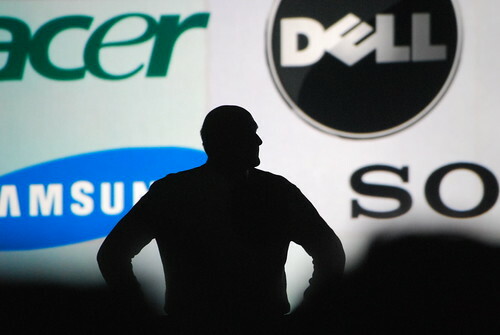 The main screen was still on, showing a list of company names - and there was Ballmer, standing silhouetted against the bright background. A rather iconic image, if I say so myself. Someone should buy that from you. Reminds me of Georce C Scott standing in front of the giant US flag in MacArthur. moral_vacuum's right; you should try and place it somewhere. Quite correct. Serves me right for trying to recall the neames of American generals at 2:20am.